Five years after Cipher and Team Snagem were disbanded by two young Pokémon trainers, a cruise ship carrying Pokémon disappears under mysterious circumstances. Shadow Pokémon reappear in the Orre region, so a young Pokémon trainer called Michael, armed with an advanced Aura Reader Snag Machine and his Pokémon Eevee, sets off to snag all of the Shadow Pokémon and free them. Travel the Orre region and battle other trainers. When you battle a Shadow Pokémon, you can weaken and capture them with a Poké Ball. Shadow Pokémon are stronger than ordinary Pokémon, but they may disobey and attack the trainer. As you train with them, their hearts will open and you free them at the Celebi Shrine. "There's nothing under the truck, except maybe a Grimer or a Muk." This refers to a lone truck found in Pokémon Red & Blue that inspired many fake cheat codes, usually claiming to unlock the 151st Pokémon, Mew. One of the trainers you face has a Cacnea and a Chimecho, and comments that they know of someone else with the same Pokémon. This is referring to James, one of the members of Team Rocket from the anime series. 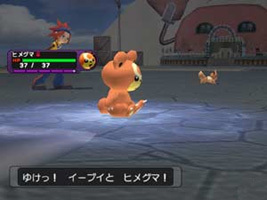 During the Advanced Generation series, he also carried a Cacnea and a Chimecho. When the Mecha Groudon launches from the basement, it rises up from the ground through a fountain. This is spoofing a number of Super Robot shows, popular in Japan. In particular, it is almost a direct copy of the launch sequence in Mazinger, one of the first Super Robot shows.